Like all little girls, I had lots of dreams for my life. Dreams of who I would become. Dreams of my wedding day. Dreams for my future husband and children. Dreams for all that I would accomplish. God is anxiously waiting to answer your prayers and fulfill your dreams. But he can’t if you don’t pray and he can’t if you don’t dream. Some dreams changed and evolved as I grew to adulthood, but some stayed constant. I’ve always felt I can accomplish anything, so pursuing dreams is always on my radar. It’s an active pursuit in my life. Some dream-chasing works out better than others. Some dreams are still in the works. All of my dream pursuits help me stretch and grow and gain clarity about what really matters. Some dreams came true and I found they weren’t quite what I had romanticized in my mind… like finally, in my late 30s fulfilling my lifelong dream of owning a horse. Or some dreams weren’t worth it, like forcing my kids to play the piano. It turns out that was me trying to live my dreams through them, not their dreams for themselves. Some dreams came true and I have lived them and loved each moment. My dream now is freedom. Freedom to spend our time as a family however we want. Freedom to go where we want, when we want. Freedom to live with intention, crafting the life we choose rather than passively letting life happen. Freedom to contribute more good to the world. That dream has been brewing for a while, and has taken hard, painful, super scary risks to bring it to pass. The more we’ve fought for the dream, the more sure we are that it is the right thing for our family right now. But that doesn’t make it easy. Things haven’t worked out when we wanted, and we have yet to see if they work out how we want. But even if they don’t, it’s okay. Because the Lord has something else planned. And the lessons learned in the journey, though painful, make me better. I think that’s what it means to trust God. It’s like the story of Shadrach, Meshach and Abednego in the Bible. Condemned to a fiery furnace for refusing to worship a golden image, they testified that their God could deliver them from the fire. But they were keenly aware of the distinction between “could” and “would.” Absolutely God could deliver them. But would God deliver them? Was that his will? Hence, they continued their conviction of faith with, “But if not, [we still will obey God. ]” There’s a lot of power in “but if not.” Even if my prayers aren’t answered how I want, I still trust him. It’s not because God doesn’t care. It’s just because his timing or his plan is different than mine. My job is to work hard to determine his will and align mine with it. God is much less a divine dictator who demands perfect compliance to a predetermined plan for our individual lives and much more a co-creator with us of the kind of lives we want to live. I’m realizing that dreams can and do change. I don’t know what mine will look like down the road, but I do know that I am the primary factor in whether my dreams come true, especially if I align them with God’s plan. I can prioritize what’s most important. I may not be able to have it all, but I can make choices to have or do or become what’s most important at various stages. My dreams right now are based around my kids, wanting to maximize the time I have with them, to experience the things together that I don’t want to miss. When they move on to adult pursuits, no doubt my dreams will change again. I do know that my timing is different from God’s and that can be highly frustrating, sometimes even heart-wrenching. But I also know that the things in life most worth having are hard. And worth waiting for. They take time. They take sacrifice. And I believe that when doors are shut, it’s because there is something better in store. When prayers seem unanswered, there’s a reason. That’s where faith comes in. You are a bright light in a world of burned out lights. I know God has a plan for me and for my family. My job is to help bring to pass that plan. This requires acting in faith even when I don’t have answers. Though I can’t see the big picture, he does. And if I listen really closely and put in the necessary spiritual effort, slowly I can recognize one little step at a time. I can move forward, inch by tiny inch. I can take one step into the darkness and hope and work for the next bit of light. Because I am sure of God’s love for me, I can move forward with joyful confidence even without the answers I seek. In fact, once I’m moving instead of waiting, answers come more readily. I can make decisions that seem scary to others, filled with peace, because of my faith. I can take action to bring my dreams to pass– even big, moving, sell-it-all, live unconventionally kinds of dreams– because God wants me to succeed. I was made for greatness. I was made in his image and my dreams are part of my divine inheritance from my Father in Heaven. Who am I to pursue big dreams? I am a daughter of God. You, too, are a child of God. 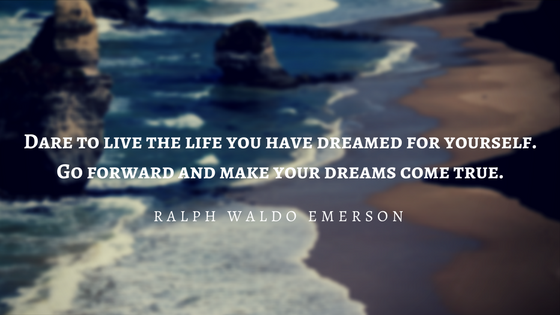 What dreams will you pursue? I’d love to hear your thoughts. If you found this uplifting, please share on social media.